Making Pet Wishes Come True! If you were a dog, what would you wish for? How about a Fairy Dogparent to stop by while your people are out, take you for a walk, play with you, maybe give you some treats?! That would be a dog's wish come true. You can bring that 'magical' joy to your pet's day! 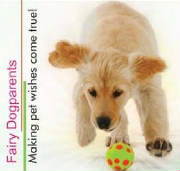 Fairy Dogparents delight in exercising & entertaining your pet when you can't be with them. We love cats & other pets too!